Today we went to the Picasso Museum that was holding an entire exhibition talking about Picasso’s most famous work, Guernica. Guernica was a painting by Picasso, finished in 1937 that depicted a Nazi and Italian fascist attack on the town of Guernica in Spain during the Spanish Civil War. 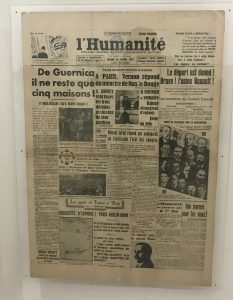 The Germans and Italians supported Franco to become dictator of Spain so they attacked Guernica, a town mostly full of women and children at the time because of the civil war. Picasso created this painting to capture that scene and it has gone on to become very well known and famous. 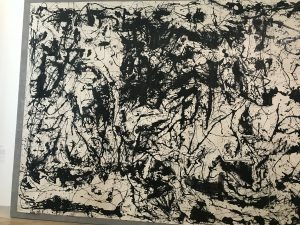 At the end of the different artist recreations of Guernica, there was a small hidden room that I found that lead me to one of my favorite pieces in the museum. This cartoon was created by cartoonist Plantu which was made in November of 2015. The picture reads “We wanted to see the Picasso exposition at the Grand Palais but the museums were closed because of the tragedies in Paris. We didn’t see Guernica at the museum. 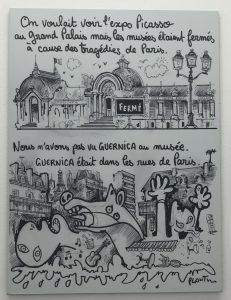 Guernica was in the streets of Paris.” This cartoon really spoke to me because it brought me back to the time when this incident had occurred. I remember a lot of people were scared because they feared what they said or wrote would leave them the same way. Many people posted on Facebook and held demonstrations around the world that said Je Suis Charlie to stand for those journalists who were killed by the terrorists. 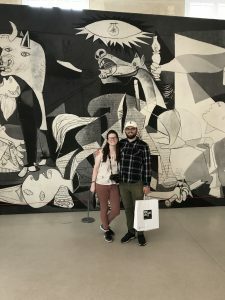 I think this was very important because it spoke about how this stuff didn’t just happen and then it was over (Guernica bombing) these tragedies still continue today in different forms and another work that spoke about that was. The Nazis had a profound effect on the people of the world during the 30’s and even art. Hitler stole a lot of art when the Nazi regime began to destroy Europe during World War II. 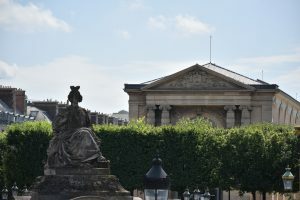 Later at night, me and Aidan went to see the Jeu de Paume which is situated at the end of the Tuileries Garden across from the Orangerie where we had gone earlier last week. 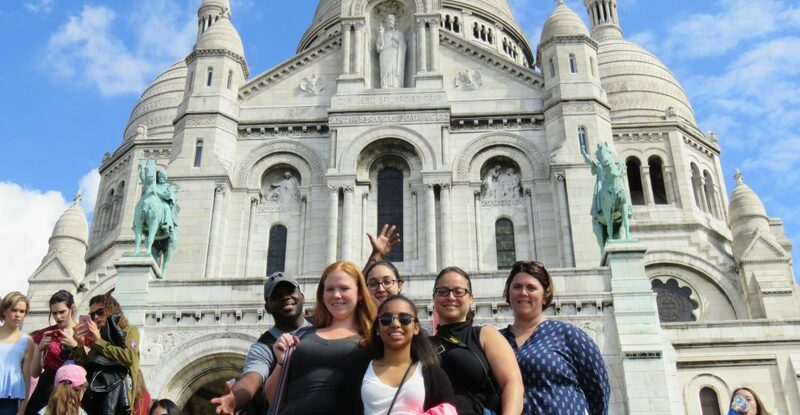 For me it was really important to visit the Jeu de Paume because in one of my classes this past year, we learned about the Nazi’s and Hitlers love and disgust for different pieces of art. Rose Valland worked at the Jeu de Paume as a volunteer and spied on the Nazis, secretly recording where they were shipping stolen artwork from all around Europe. The Nazis were unaware of the spying because they assumed she did not understand them because they spoke German but Rose was very educated. Because of this, when the war ended, the allies were able to quickly recover a countless number of missing, priceless, works of art. 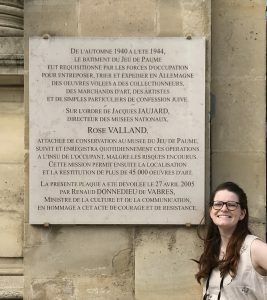 When we went to the Jeu de Paume there was a small plaque on the outside of the building that talked about who Rose Valland was and what she did but other than that small sign on the side of the building there was virtually nothing about her. The inside had very contemporary art pieces featuring photography and videos however there was no sign of the history of the building and how important it really was to saving art. Even at the bookshop I was at least expecting something but all i could find was a children’s book about Rose Valland. This upset me because she was very important to the art world and this time and what she did could have had her easily killed if she spoke to the wrong person. I think this is why it is very important to look at history and not forget about it whether it be good or bad. This is why I enjoyed all the artists recreations of Guernica because it helps the tragedy live on so hopefully we can move past it but still acknowledge that it happened. I think there should at least be a statue or a small room about the Nazi occupation of the building and that she should be more commemorated.